This experience illustrates how to locate destinations within a floor plan. It can be used for shops in a mall as well as units in an apartment / floor plan or even people in an office building or school campus. 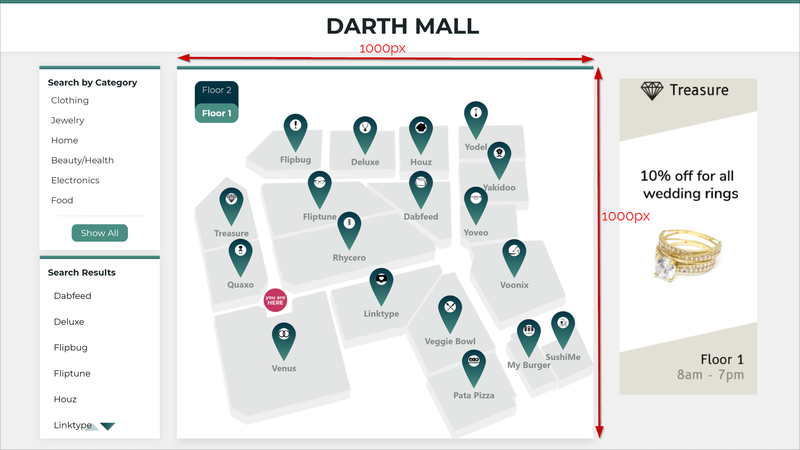 place an image of the floor plan in a Group collection. Excel is being used as a database. Watch this webinar recording to learn more about working with Intuiface & data sources like Excel. Each list on the left side of this experience is fed by a sheet of the Excel file that powers this experience. the toggle set property is used to make sure a user cannot select two categories at the same time. The Show all button is also a toggle button with the same toggle set property, so that when you check it, it automatically unchecks the last selected category. 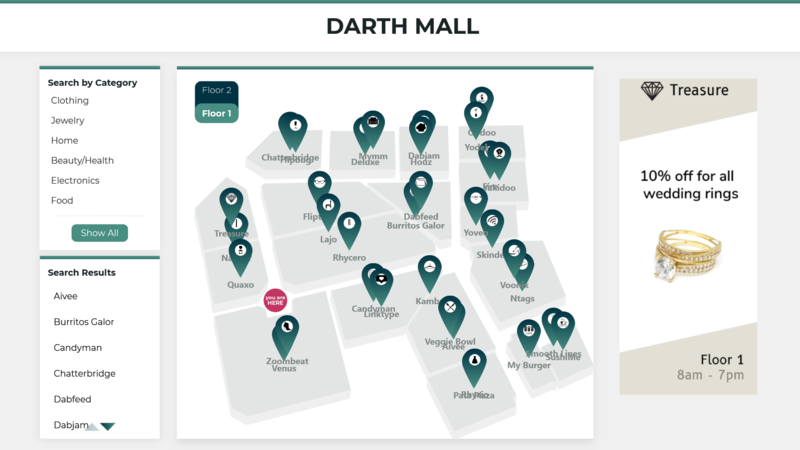 the display of the Active Group collection, located within the map, to highlight where the shop is located on the map. the display of additional details about the selected shop within a Details Panel on the right side of the experience. To make this sample easy to reuse, we created a 1000 pixel x 1000 pixel image for the floor plan. Each shop in the Excel worksheet has a unique X,Y coordinate that is relative to the top left corner of the floor plan image, which has a coordinate of 0,0. Each shop is identified with a pin using a Group collection containing multiple elements bound to the appropriate row within the Excel spreadsheet, such as the icon and X & Y position. move the Active Group collection within the map to the selected pin on the floor plan and then display it.